Hey UMSL Business! Ever wonder what it means to be a media studies major? It seems like we all know one, but what do media studies really entail? As a media studies major, I have a broad selection of areas I can choose from for my focus. Which is one of the biggest reasons I chose to major in media studies! The areas of focus include public relations, advertising, and media production. Although none of these areas include digital marketing! Excuse me UMSL, why not?? 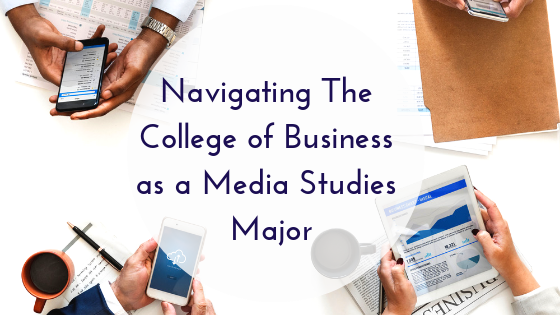 I chose to major in media studies knowing that I would like to gain experience and explore my options in the digital world, but it did not occur to me that I would find myself in the college of business to do so. So here is why you have been running into so many communication and media students in your business classes! Digital marketing goes hand-in-hand with the skills of media and communication, so why it not offered as an area of focus for media and communication students?? Key components of digital marketing include brand, social media, advertising, support, trend, and strategy. All of which are skills that as a media studies major, I will acquire or have already acquired! Gaining skills in digital marketing will be extremely beneficial for any career that I decide to pursue with my degree in media studies, similar to how the skills I gain within the media studies realm can be beneficial to a career in digital marketing. Let’s compare a business student’s requirements to a media studies student’s requirements. Here at UMSL, the College of Business has completely different requirements from the Media and Communication department in the College of Arts and Sciences. To start the course requirements are completely different – a business student is required to take courses like microeconomics, macroeconomics, and accounting. Gross! This is why I’ll stick to communications. A media studies major’s core requirements are more communication based like media theory and mass communications. Before graduation, media studies majors are required to do a practicum, internship, or senior project which is different from business students who have to pass the business assessment testing. So, com and media students – the answer to whether digital marketing will be relevant to your career is YES! Just as relevant as it may be to you, business students. Today’s world has gone digital and it doesn’t look like it will be going back anytime soon! Now you have some answers to why you have been finding so many communication and media studies majors in your classes. I did some searching for an option that would allow media and communication students who are interested in digital marketing to earn a certificate or degree. I found that the College of Business offers a minor in Digital Marketing Communications, a 15-credit hour program that students of any major can choose to earn. Be right back, enrolling now! Now that you can distinguish a media studies major from a business major, go visit https://bit.ly/2Vedeu2 for a closer look at how a minor in Digital Marketing Communications could enhance your skill set and add to your resume!